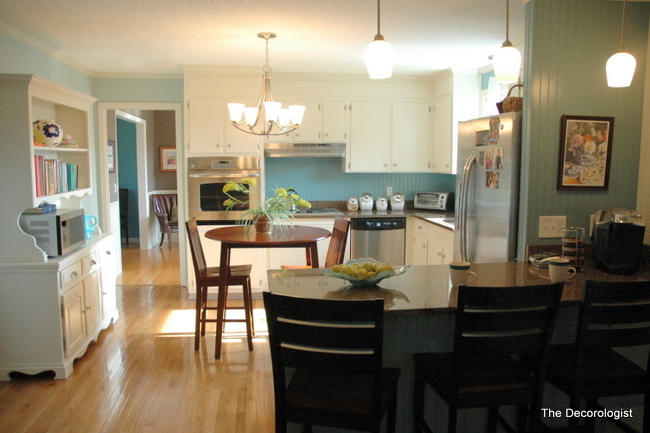 There is simply no reason you must live perpetually with a dated wood kitchen if you don’t want to. Or live in a dark, wood-paneled den just because your home contains one. And, no, you don’t have to rip the wood paneling out. 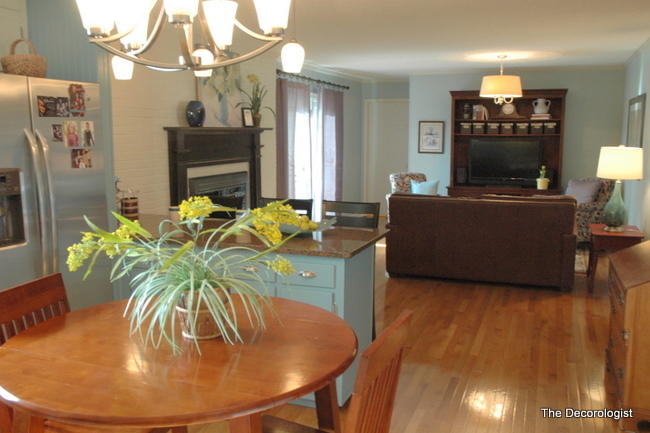 My clients spent 16 years with dark, dated wood cabinets and wood paneling in their kitchen and adjoining den. 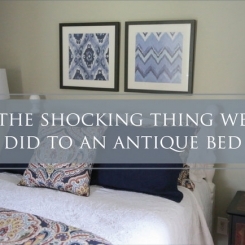 Because their Nashville home is a 1970’s ranch, they honestly believed that they had no other choice but to live in that era as long as they lived in that home. Not true! Honestly, it took a bit of convincing to reassure my clients that painting wood paneling would work and not result in a half-baked result. They thought they needed to rip out all their cabinetry and start over, which would have been prohibitively expensive. They were paralyzed by fear and lack of vision. Once I gained their trust, we began moving forward towards an amazing outcome. The proof is in the photos. Get ready for the transformation . . . Granite countertops, stainless steel appliances, and updated lighting helped bring the kitchen into the 21st century, but the paint updates really make the biggest impact. The hutch you see to the left is great additional storage for a kitchen with no pantry. It was previously in the dining room, but I encouraged my clients to paint the dated oak piece white and move it into the kitchen. Notice the expanded coffee bar area with seating – the existing peninsula with an extended countertop created a new space for seating. 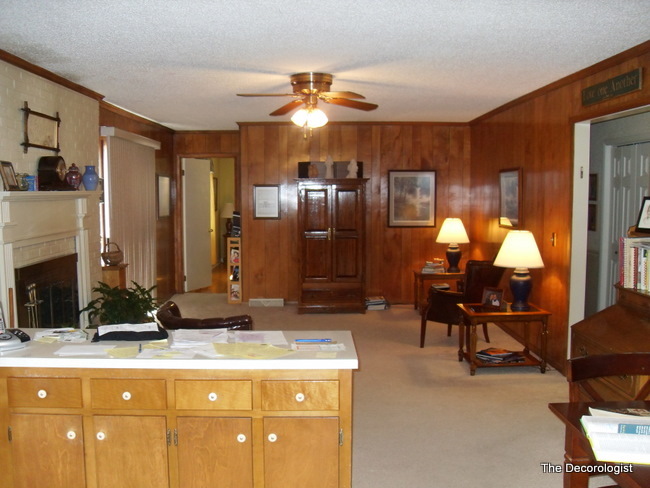 Painting wood paneling will change your life! 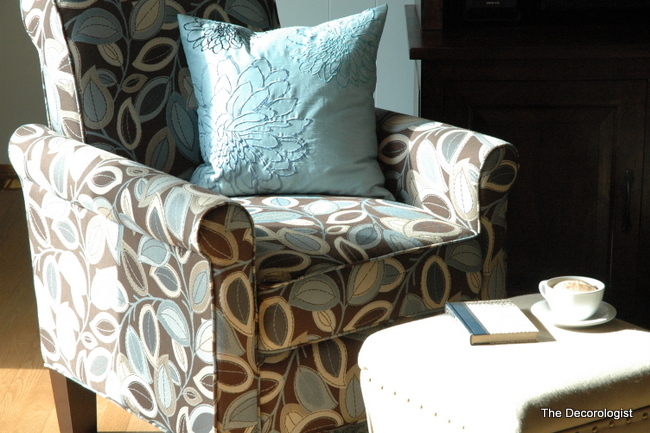 The paneling remains, but Benjamin Moore’s Woodlawn Blue transforms the look and feel of the space. The addition of black accents including the painted fireplace mantel, bar chairs, and drapery rod add sophistication and gravity to the airy and light room. Dark days are over, now everything’s light and bright! 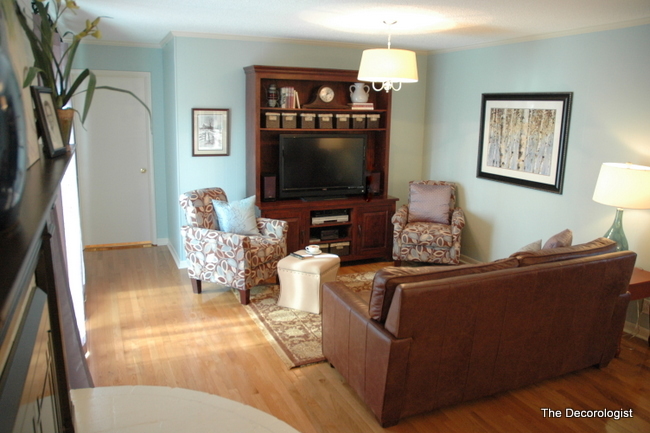 New furnishings and updated lighting make the den a family-friendly place to gather and watch television. As an interior decorator my job was to cast the vision, specify the right colors, and provide expert shopping within their budget. These homeowners did most of the work in this lovely transformation themselves: painting, installing new hardwood floors, and installing the new beadboard backsplash. Their hands-on involvement resulted in a beautiful home that they can feel happy and proud to spend the next 16+ years in. Really, do you need any better proof that you should paint your dated wood paneling? This entry was posted in Design Intervention, Popular Posts and tagged 1970s ranch, beadboard backsplash, beadboard paneling, benjamin moore, black accents, blue, dated, decorologist, how to, inexpensive, interior decorator, kitchen, living room, nashville, paint, painting, paneling, room makeover, update, white, white kitchen cabinets, wood paneling, Woodlawn Blue. Great points, Kristie – just more excellent examples of why paint is the most economical way to get the greatest change. Kristie…You did it again! Love following your work! I wish all clients were convinced that it could look this fabulous!! What a transformation!! I don’t think I’ve ever spent so much time scrolling between before and after pictures in any of your posts. Holy moly that looks amazing! Such a transformation and I love that they did most of it themselves. Definitely ogling that beadboard backsplash! a beadboard backsplash is certainly one of the easiest and most affordable ways to go – and it looks great, really classic. Thank you, Thank you for showing the beadboard backsplash. I had thoughts of doing that in my kitchen but when I said something to my daughter she crumpled up her face and said, it’s your house so then I doubted myself but after seeing this, guess what I’m doing! Yay!!! Paint it in semi-gloss, so it’ll be easy to wipe clean from splatters. 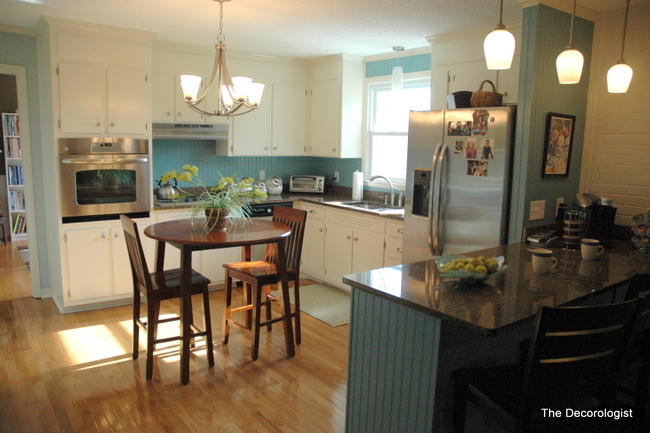 Beadboard is one of the BEST backsplashes to have, even if it were more expensive (and it’s NOT)!!! Love it!!! 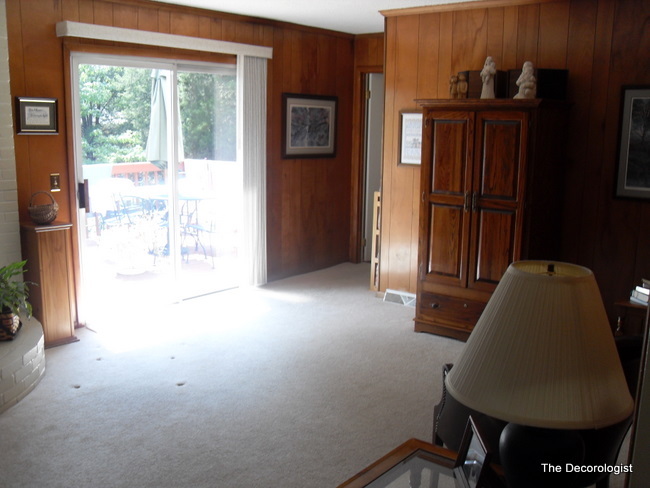 I would paint paneling in a heart beat…..the space is gorgeous now. What a complete transformation! Bravo Kristie!!!! WOW!!!! I love it! I never get tired of seeing the before and after shots. I love that you moved the light fixture from the center of the den and created that “off center” gathering place. I would never have thought that would work but it looks wonderful. So excited for your client. It is CHIC and refreshing! GOOD JOB my friend! thank you so much, leif! sometimes you just have to move a ceiling light fixture for the room to make sense – either over a table or in the center of a conversation area. Beautiful transformation! Great work Kristie, thanks for sharing. This gives us all hope for rooms with paneling! Such a difference that some lighter colors made in both rooms. Love the look. The white goes so well with the beach blue. Makes me wish I had some spare time to dive into my ugly outdated cabinets at home tonight! Absolutely amazing!! I am always checking out before and afters and I am still always so surprised at how much difference a coat of paint can make. These rooms are so lovely and livable. Yowzer!! What a beautiful difference paint made in this home. I can only imagine how very thrilled the clients must be. Bravo my friend! It looks great and is adding to my inspiration! I am planning on painting my kitchen this summer. It has knotty pine walls and NO ONE thinks I should paint it. I, however, can not live with it anymore! I can’t wait to do it and I hope it turns out as lovely as your project. Bravo Kristie! The space looks fantastic!!! 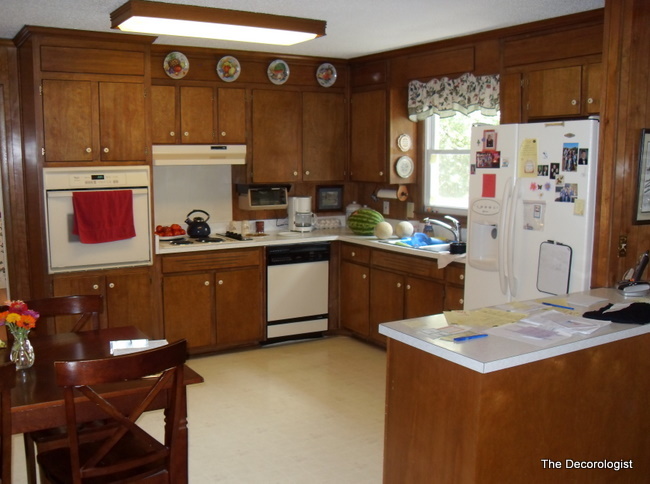 Painting paneling and cabinets definitely worked for us!!! Spectacular Kristie! Your clients must be soooo thrilled! What a beautiful transformation! 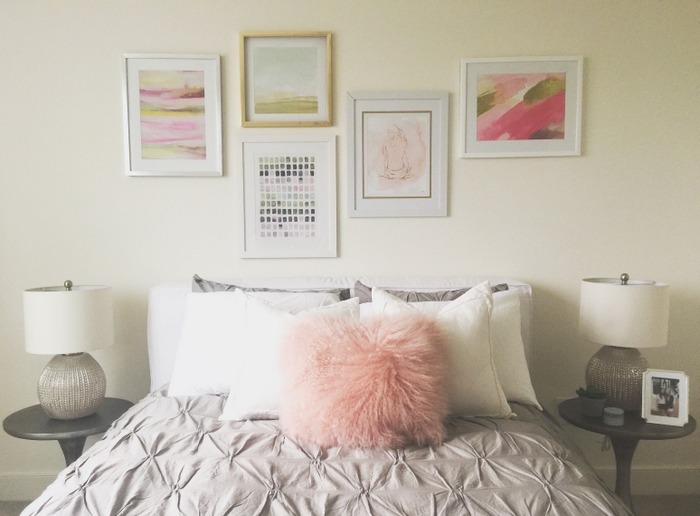 I’ve painted paneling but I’ve always gone with a “safe” color like white or gray but now I feel like even more options have opened up in front of me. This looks beautiful! What a lovely transformation! Everything is just beautiful and fresh. What is it about guys not wanting to paint either wood or brick? When we bought our home 13 years ago, one of the first things I wanted to do was paint the brick. Hubby was incredulous. I finally wore him down, but it took ten years. He even volunteered to paint it! And now it’s a lovely shade of warm green. He can’t believe he fought me on it for so long, and he loves it! I’ve even convinced him to paint several pieces of wood furniture! Wow…that’s great. It looks like a completely new home. I’m looking for a for just that very thing. However, I need a fairy godmother and a magic wand and some very hand mice..lol. Wow, another amazing transformation, Bravo Kristie! What about paneled walls with molding in the home office? House built circa 1999, we’ve lived here 9 months. The realtor said we should NEVER paint it because it adversely effects resale potential. I’m thinking I don’t care. It’s oak, not even quarter-sawn and the room is dark and dreary. I know painting it would make it a fabulous room. I assure you, it will not negatively effect resale if it is done well! Thanks for the amazing Before and After pictures! This is a perfect example of a house with “good bones” as they say…and just needing a little help to show them off! This is quite possibly the BEST kitchen re-do I’ve *ever* seen! Spectacular! From a dark and dated cave to a beautiful light, modern, INVITING, happy space. LOVE IT! And love bistro table… perfect! I, too, have dated ugly wood paneling. I’ve been waiting for an “ugliest kitchen contest”, but since I haven’t found one, I’ve just left the paneling. After seeing this, I want to cry! I am so excited to give it a try! This is amaziiiiiiiiiiiiiiiiiiiiiiiiiiiiiiiiiiing! Great job! What a beautiful transformation! The colours are sublime. Just a question on whether you have any tips on preparation to ensure a long-lasting paint finish on the panelling? I’d love to recommend this to a few “clients” (read family!) to update their home. Proper prep work is definitely key. Thoroughly cleaning and sanding of wood paneling is necessary, then a good bonding primer before painting. Love this! This is one of my favorites!! 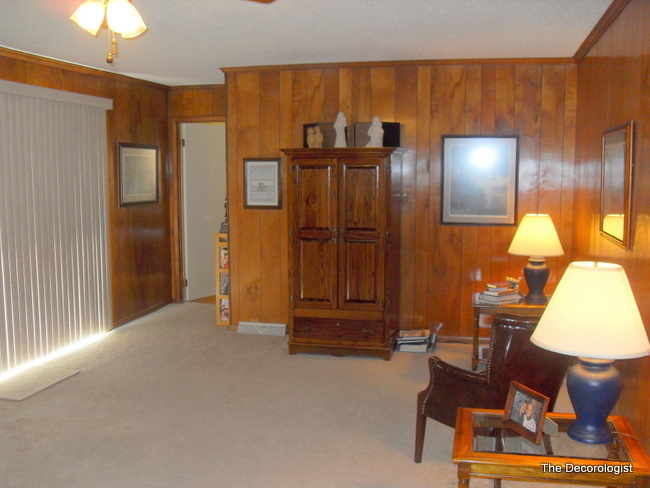 This is one of the best before and afters i have seen of wood paneling…bravo!!! I am amazed at how fabulous it turned out…they must be in awe of you! Great job…. 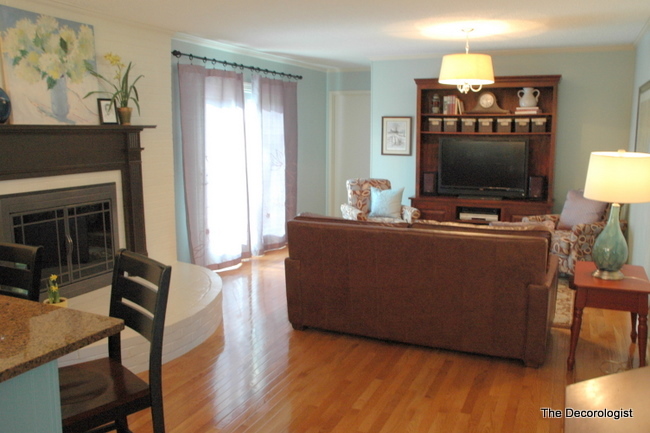 Love that fireplace hearth! wow, really nice…I wonder where they got that leather sofa, looks good. great transformation. We got the sofa at Merridian Furnishings here in Nashville. All I can say is, “WOW!” Kristie, this has to be your most stunning reveal yet! Like a previous responder, I just kept scrolling back and forth to really soak in the ‘before’ and ‘after.’ I would be looking for excuses to be in that kitchen and den now. Simply beautiful and very inspiring. Makes me want to create some bold and grown-up changes in my own house. Wonderful work. Thanks for posting. This doesn’t even look like the same place! Yet another Kristie-on-fire makeover!!! Practical perfection! This is gorgeous. Paint is something awesome. Now following you. Wow, what a transformation! Your pictures are always so well done, they really show what is possible. Very impressive, and I share your love of paint!!!! Bravo! I say paint it, paint it, paint it! I just painted my kitchen, too. It’s amazing what a few cans of paint can do! Wow!!! What an amazing transformation! 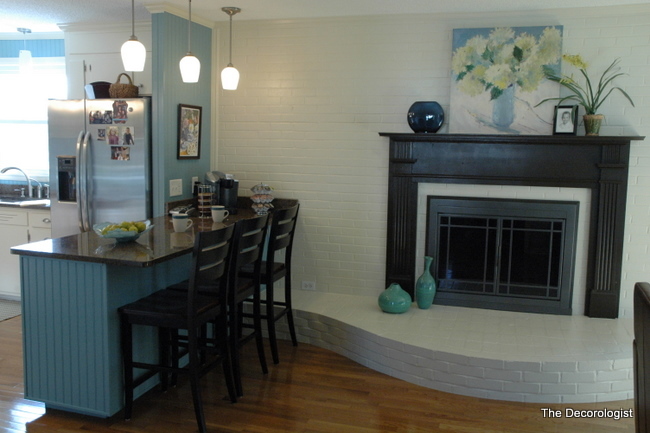 I love the color combo and the fireplace brick looks great. This transformation is incredible. Do you have the instructions for painting 1970s style wooden cabinets? Wow, that looks gorgeous! It really is amazing what a few cans of paint can do. Great job! I just love this makeover, that blue on walls is beautiful . I ordered the chairs but without the arms. I was glad to see them here with a brown sofa. Do you recall where you got the rug from? You are awesome. Do you work any in Georgia? Hi, I’m moving into an apartment soon with paneling and will try and paint them. How do you make them look so smooth? Looks like regular dry walls. Any advice? Thanks a lot! Have you been in my house? My house was built in 1970 and has that exact paneling on every wall, floor to ceiling, entire downstairs. The cabinets in the “before” pics look just like mine, and that boxy light fixture hangs over my sink!! I was happy to see the turquoise walls — I just painted my kitchen walls turquoise and green, and had already planned to paint my cabinets white! So nice to see an “after” pic before its done!! Thank you for the funny and inspiring website! This is amazing!!!!! 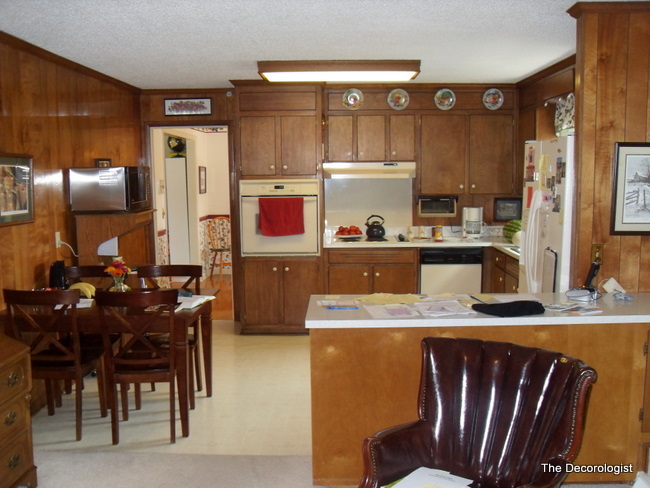 We are looking at buying a house that has a kitchen that looks almost identical to the before pictures. What was the budget for this amazing kitchen? This looks amazing. I have a living room and hallway of horrible wood. Is there any recommendations for colors I should use to cover the wood? Can I choose any color I want? P.S. The wood walls have horizontal line design textures that will be noticed even after painting. 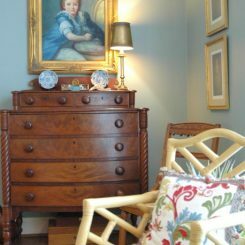 It’s ok if you are left with texture – don’t let that stop you from painting that wood! I actually like the lined look of painted tongue-and-groove walls – more character than flat drywall, right? Yes, you can choose any color you like. If you are scared to go a real color, a nice off-white will brighten that hallway like you wouldn’t believe. LOVE THIS KITCHEN! We’re going to duplicate but on a smaller scale in the house we just bought. Wondering though about the floors. Those changed as well. Do you know what kind of flooring that is?